Halloween is growing in popularity in Australia and while I was initially a bit sceptical about the holiday, I’ve come to realise my kids are going to jump on board with or without my endorsement. I figure I am best to shape it into something we as a family are happy to engage with rather than let them take the lead and potentially end up involved in a way we aren’t comfortable with. 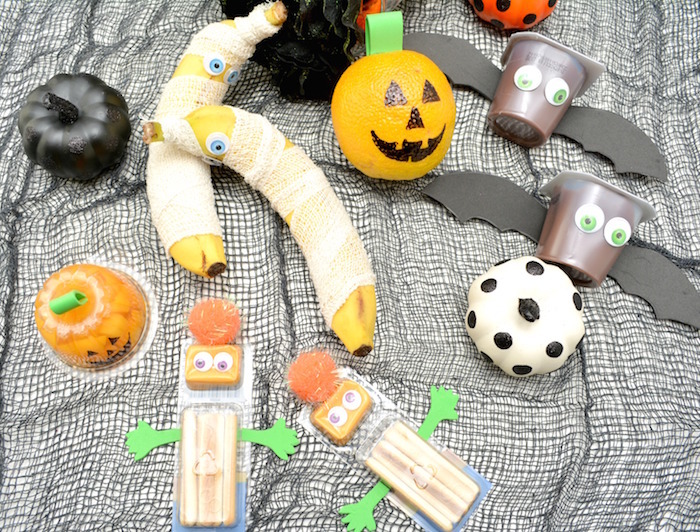 One way we’ve created some fun and excitement around halloween is with cute halloween lunchbox snacks. 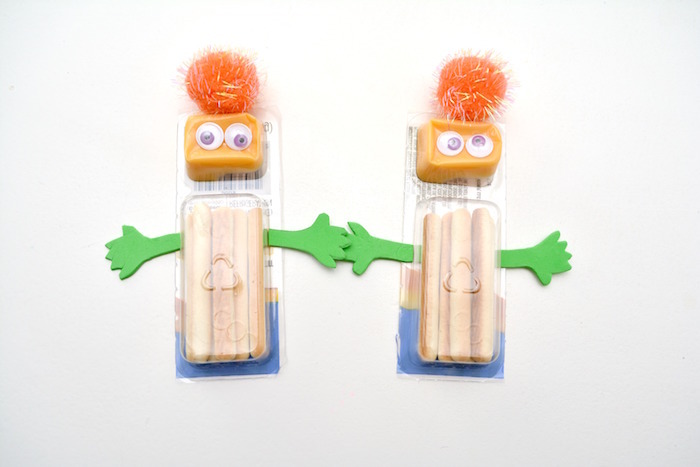 The kids love making them and sharing them with their friends at school. They are super simple, cheap and generally reasonably healthy. 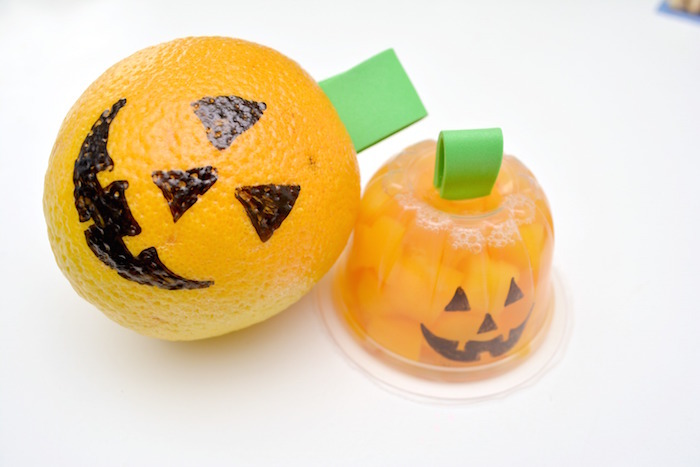 If you’ve been looking for some easy halloween lunchbox ideas, give these a try with the kids! 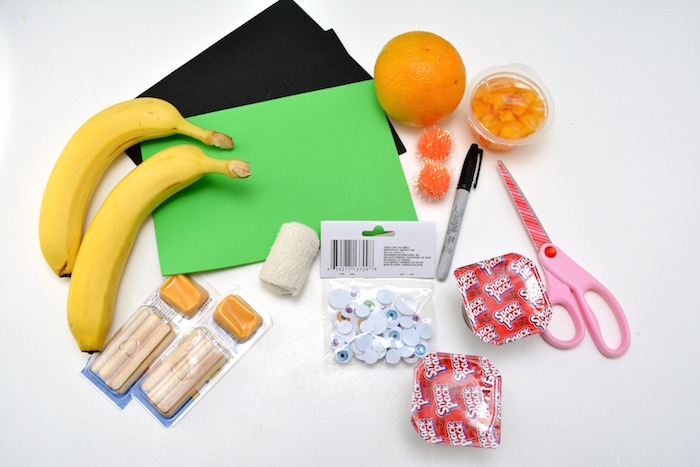 Before you get started you’ll need to gather some supplies. Many of these you’ve probably already got at home and all of them are cheap to buy from Kmart or a dollar store. 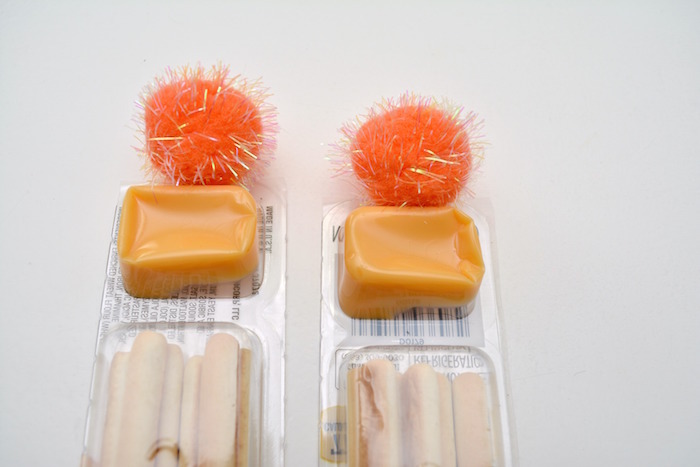 You can of course modify these to suit your child’s tastes. 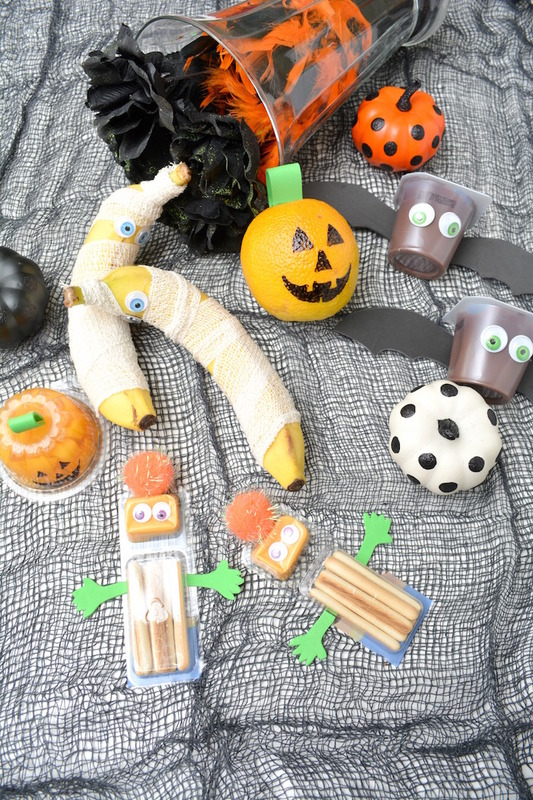 These bananas are healthy and make super cute halloween lunch box snacks. They are ideal for fruit break/crunch and sip (you can find other crunch and sip ideas here). 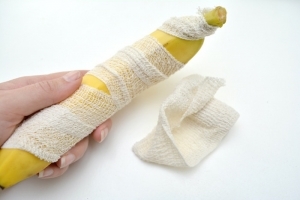 Starting at the bottom of the banana, begin randomly wrapping the gauze roll around the length of the banana. You can criss cross the gauze or leave gaps to give it more of a mummy feel. 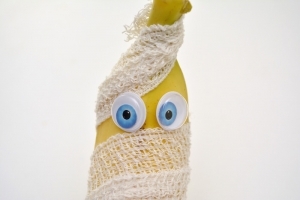 Be sure to leave a small gap near the top of the banana where you would like the eyes to be. Secure the gauze at the back of your banana with tape or hot glue. 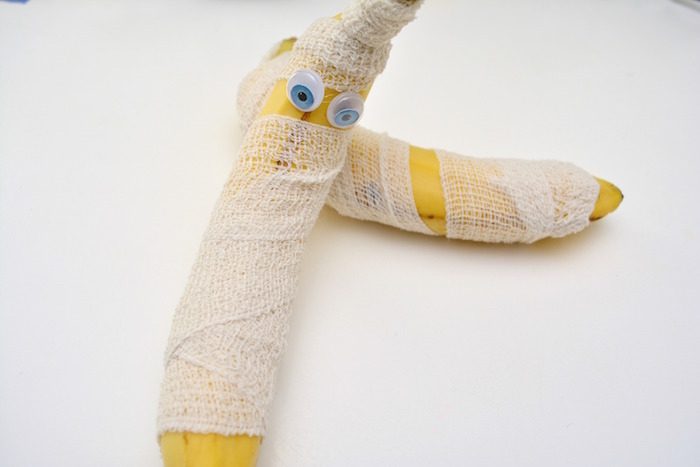 Using a low temperature hot glue gun, attach the googly eyes to the front of your banana where you have created a gap in the gauze. I love these bats. 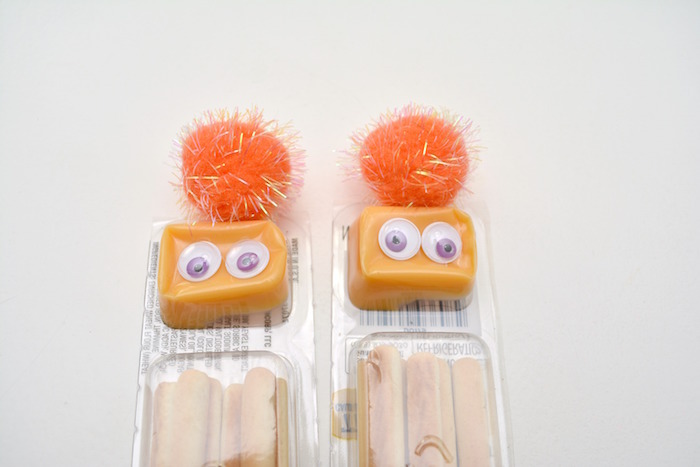 They are more of a treat than an everyday snack but they are so fun. You could even give them out to trick and treaters. Cut out two bat wing shapes from the black craft foam. 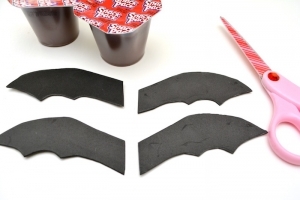 Be sure to leave a small bit of extra foam space on the inside of the wing to attach it to the back of the pudding cup. 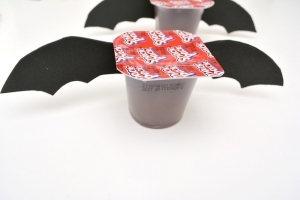 Attach the wings to the back of the pudding cup with hot glue. 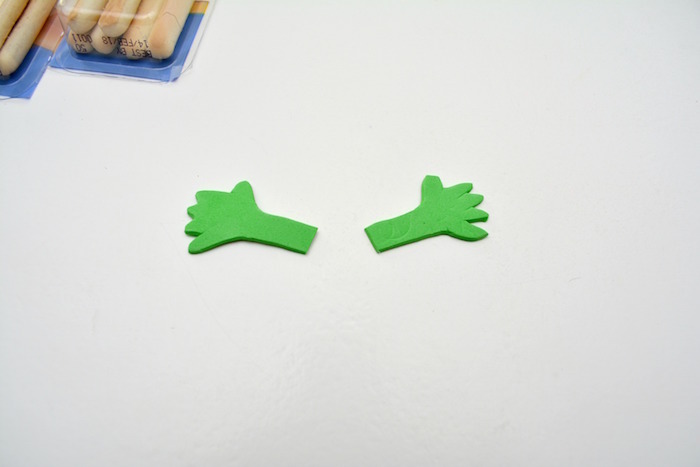 Let the glue partially dry and cool down a second before attaching the wings to help eliminate the chance of the glue melting the plastic container. 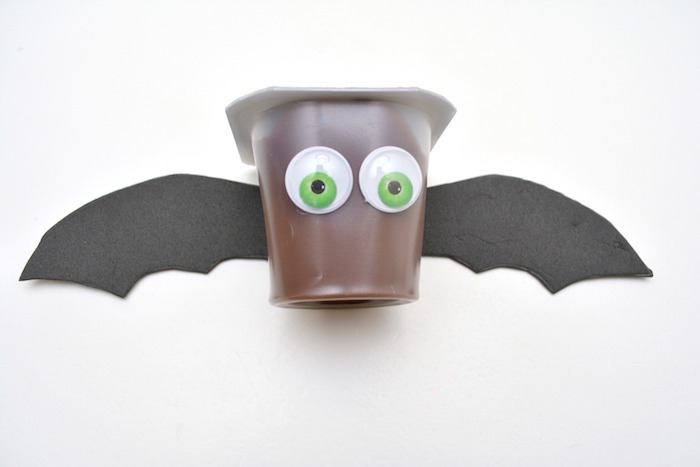 Using the glue gun again, attach two googly eyes to the front of the pudding container. 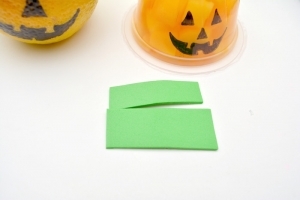 Another great Halloween lunchbox idea. You possibly already have these in the cupboard so they are easy to make. Another good halloween snack idea that’s perfect for fruit break. 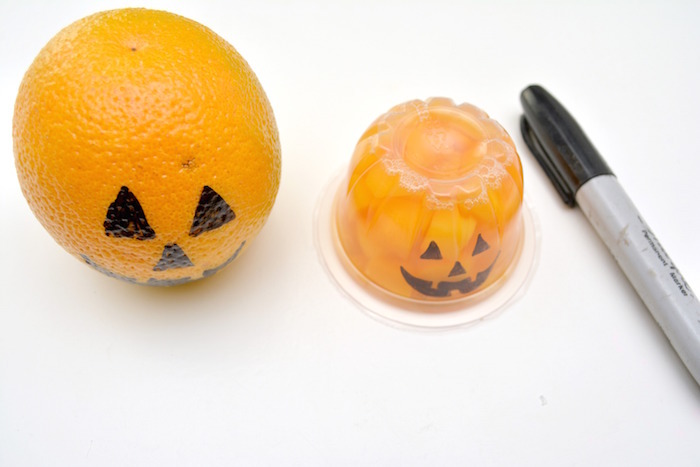 You can use oranges, mandarines or fruit cups. For this snack, you can use either an actual orange, or a package of orange or peach slices. Begin by drawing the face of a Jack-o-Lantern onto the front of the orange itself, or on the front of the peach or orange slices container (apricots work too). So easy & so cute. Super simple halloween snacks that make the perfect halloween lunchbox ideas or after school snack. You can make them ahead for the week so they are ready to go in the morning. They also make great sweets/candy alternative for trick or treaters!